9 entries categorized "Geek of Remodeling"
Things are taking shape in the kitchen. 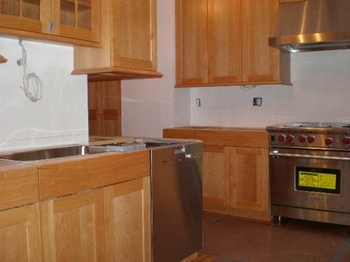 The appliances went in today, and all the wood trim on the doorways and cabinets is done. All that's left is the countertops and tile backsplash, plus a few minor things like the hardware for the cabinet doors and drawers. Here's an overview of the room; you can see the new sink, dishwasher, stove, and ventilation hood. 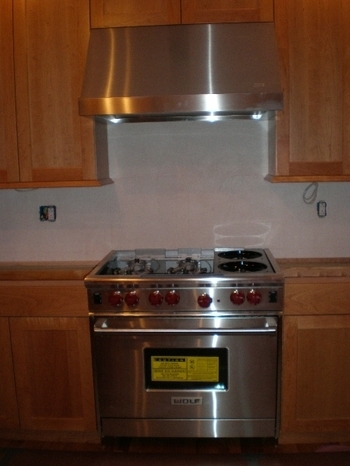 Here's another look at that stove. 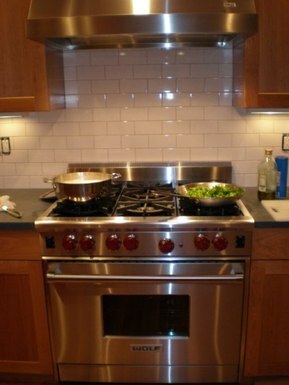 This was our big splurge in this project - the six-burner professional range of the sort that I have coveted my entire adult life. Here is a look at the cabinets in what used to be the pantry - this is where the washer-dryer was, in what used to be the butler's pantry. Looking back from the former butler's pantry into the kitchen, we see David posing with the new doorframe and window frame that got built yesterday and today. 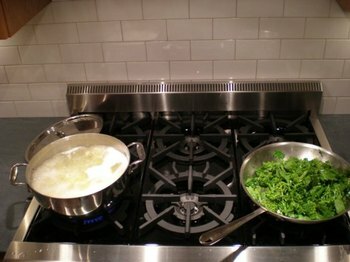 And there is that stove again! 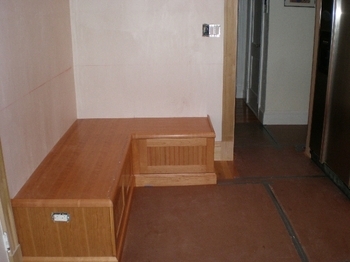 Here is the banquette - one of the fun parts of the design. There is storage space - drawers - under the seat. We will have a cushion made for it and place a table in front of it, and that will be our new kitchen seating. 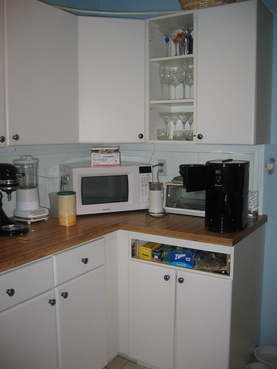 Just for comparison, I've added below a picture of what this corner of the kitchen looked like before the project began. 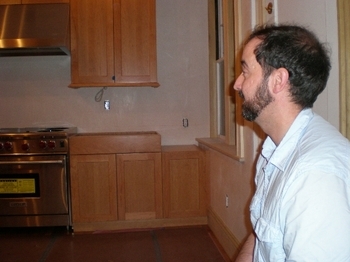 Here's David admiring the project. He says, "This is going to be sweet." 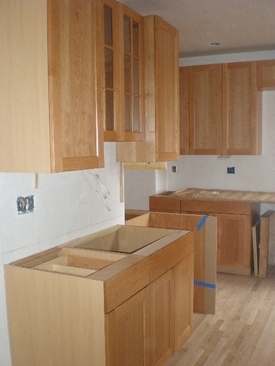 Since my last update on the remodeling project, a lot has changed in the kitchen. 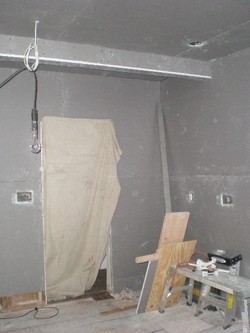 First, the gray wallboard I showed last time was nicely plastered. Then the new hardwood floor went in. 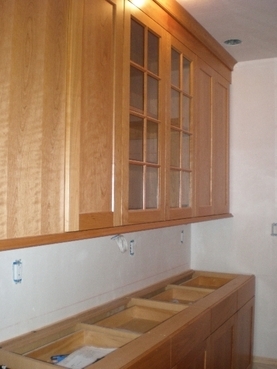 Now, about two-thirds of the new cabinets are in place. 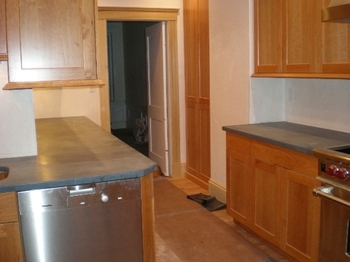 Here's a look at the L-shaped turn in the kitchen, where the butler's pantry (and washer-dryer) used to be. The gap in the front is for the dishwasher. Isn't that pretty? 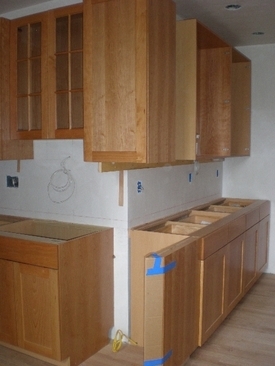 The floor, by the way, is oak, and the gorgeous cabinets are cherry with a natural (unstained) finish. We have been told that the cherry will darken a bit with age but it will retain its rich golden color and pretty natural patterns of lines. I love it. I was so excited when I came home and saw it last night that I was jumping up and down in the middle of the room. Not a lot has happened in the bathroom since I last reported - they finished the wallboard and plastering in there, and installed a new window, but that's all. The tiles are piled up in the living room waiting to be installed, and the toilet and sink and stuff are in storage at the plumbing supply place. 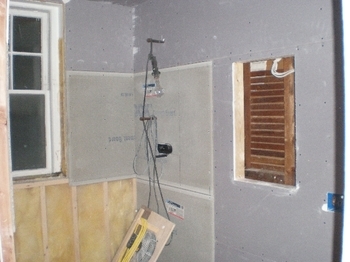 This week the wallboard went up in the kitchen and the bathroom. 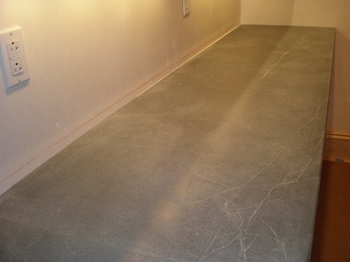 We think plastering comes next - then they'll put the floor in the kitchen, and the cabinets after that. 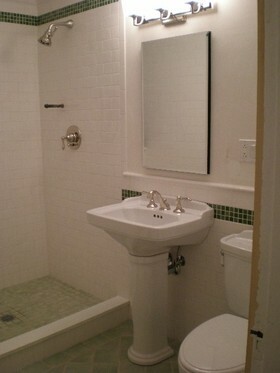 That space on the right is for the medicine cabinet. There is special wallboard around the shower - it's called "cement board" and it's much heavier and harder than the regular wallboard. I'm not certain why it's used there. 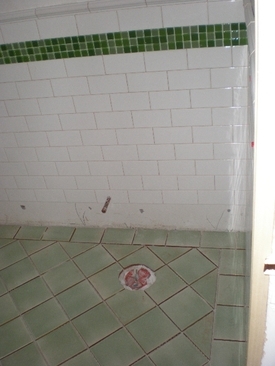 Also our bathroom tile is ready to be picked up. Here are the samples we brought home - these are approximately what we will be using. 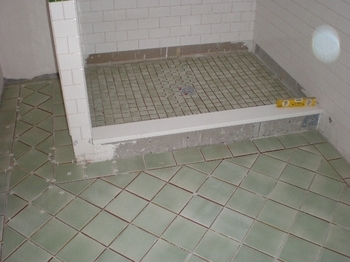 On the right are the floor tiles - the samples are 4", but we are using 6" tiles. 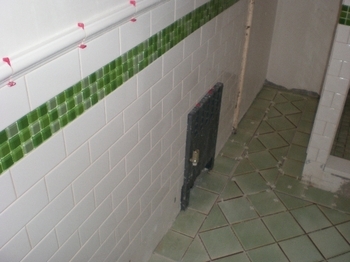 Next are 3"x6" subway tiles that we will use for the walls of the shower and a 42" high half-wall the rest of the way around the bathroom. 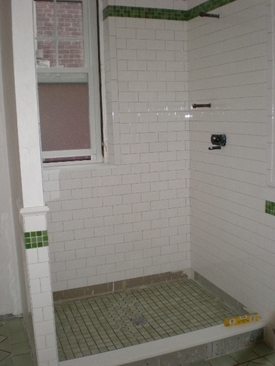 Above the subway tile are a few rows of glass mosaic for accent, followed by another row of subway tile (not in the picture) and then the chair rail tile to finish. We've gone from being totally overwhelmed to really starting to believe that we will have a new kitchen and bathroom. 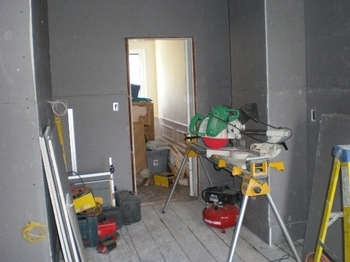 The building inspector signed off on it, and the rooms are starting to take shape and look like rooms. 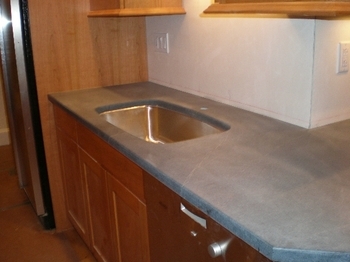 We've purchased all the fixtures and hardware for the kitchen and bathroom, and all our appliances. It's all for real! So far, the remodeling is proceeding without too much trauma. The structural problems I mentioned in the last post on the subject have been repaired (while we were on vacation, so we didn't have to watch). Other potential problems that arose turned out not to be as bad as we thought. 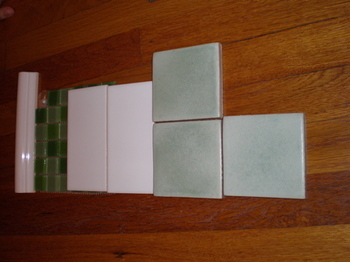 We bought fixtures for the bathroom - sink, toilet, shower doors - and ordered our bathroom tile, which will be a combination of white and pale green that we are very happy with. 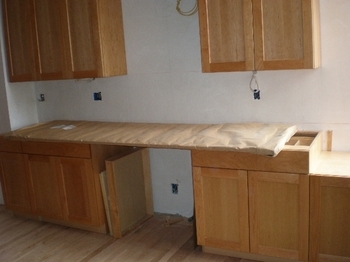 The kitchen cabinets arrived, and are piled in the dining room awaiting installation. The plumber and the electrician have done their thing - everything's all piped and wired as it should be and the inspectors have signed off on their work. It's been a little over three weeks but it's hard to believe that I ever had a kitchen or a master bathroom. Here are a few pictures of the current state of things. The framing and some of the wiring in the bathroom - the black square in the middle is the fan, and there's a can for a light inside the shower. 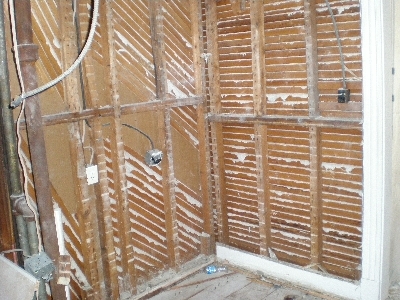 There's also a coil of wire ready for the vanity light over the medicine cabinet. 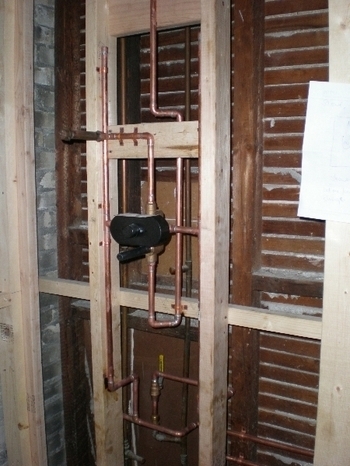 Here's a look at the plumbing for the shower. 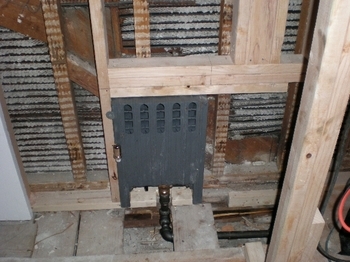 Here is the cute little radiator they've installed in the bathroom - it's so small! 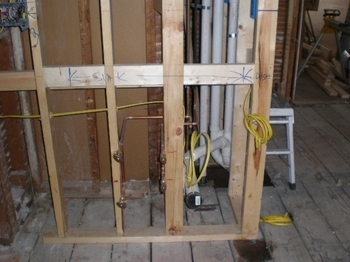 Here is the plumbing and electrical hookup for our new washer-dryer. The washer-dryer used to be in the butler's pantry that is now integrated into the kitchen; the new hookup is in the second bathroom, the one that (otherwise) is not under renovation. 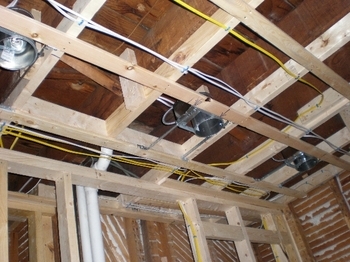 Here is some of the wiring in the kitchen - cans for floodlights in the ceiling. 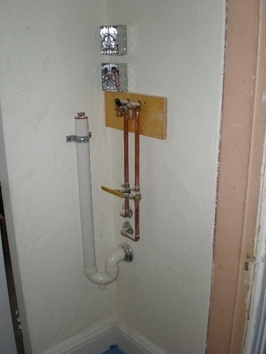 And finally, the plumbing hookup for the kitchen sink; there's also electricity for the garbage disposal and dishwasher. 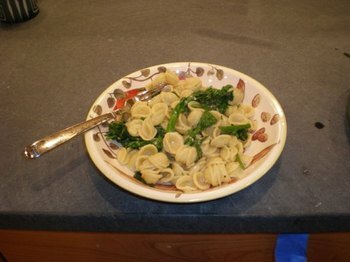 Perhaps next time I can show you the kitchen with some cabinets installed. I still don't have the "before" pictures to show what the kitchen looked like before work started - they are on the camera that David took to Calgary with him - but I got another little camera and took some pictures this morning of the kitchen after two days' demolition work. The walls are plaster lathing, an old construction technique that I don't think is used any more. The floorboards are crude, knotty 1x8s laid across the joists. This is the corner where our little banquette seating area - my favorite feature of the new design - will be located. That beam running across the top of the picture was our first unpleasant surprise. We knew there was a structural beam there, and we had no plans to get rid of it. But it turns out that it was very poorly constructed. At its heart is a pair of 2x10 planks, but the carpenter who built it apparently cut the planks too short so instead of running straight across (as a load-bearing beam should) there is a break in one of them near its end. 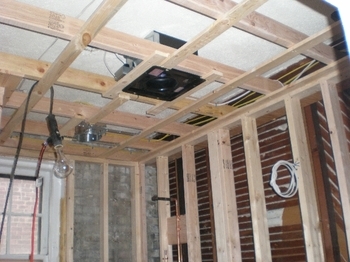 The carpenter also used whatever was handy to cap the beams together - scraps of plywood, a piece of old molding. 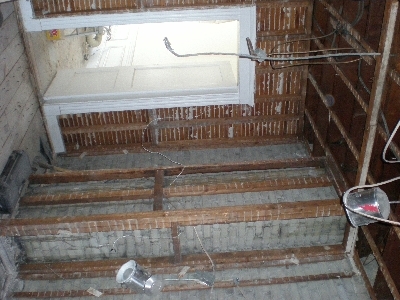 Our contractor will have to rebuild the beam because it will never pass a building inspection as it is. That means building a temporary structure to bear the load while he replaces the beam. Ouch. 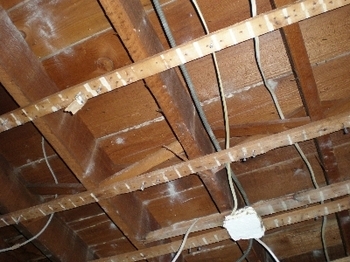 Here is the ceiling - or the underside of my upstairs neighbor's floor, depending upon how you look at things. That white square is a bit of plaster stuck to a junction box. What is the point of having a junction box if you are going to plaster it into the ceiling where it's inaccessible and impossible to find? This will be fixed before the new ceiling is in place. 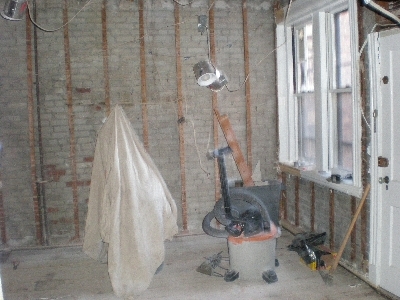 Here is a look at the back wall of the kitchen, where my lovely professional 6-burner stove will be - I hope. There is a small question whether the gas line is big enough, but the contractor said reassuring things about it this morning. There you can see the brick portion of the house. On the right is an exterior brick wall; the back wall is not exterior but butts up against the next unit in the building - I guess the units are separated by walls that are the same as exterior walls. Today, finally, commences the long-awaited remodeling project that David and I have been planning, haltingly, for several years. I am at the moment awaiting the early-morning arrival of the contractor who will shortly begin to tear apart our kitchen. 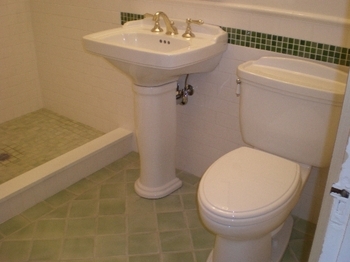 The plan is ambitious - completely gut and rebuild the kitchen and butler's pantry; completely remodel one bathroom; and a minor change to the other bathroom to accomodate the laundry, which is moving out of the butler's pantry. We live in a condo, and we'll be living with this construction all summer. Demetrius too; I hope it doesn't stress him out too much. Last weekend we moved everything out of the kitchen; we now have a makeshift kitchenette set up in the living room with the bare essentials - microwave, coffee maker, toaster, rice cooker. If they can't move our fridge (the only appliance we are keeping) to an accessible spot, we'll get a little dorm fridge too. I took a whole lot of "before" pictures, at my mother's suggestion, to remind me later what the kitchen was like before the work began. I'd like to post those here - but David is out of town, and it looks like he took the camera - not to mention the camera's USB cable - with him. So the pictures will have to wait. 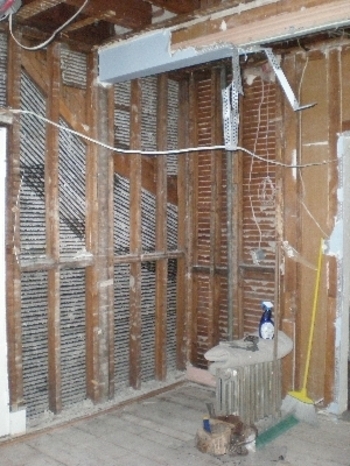 Watch this space - and the new "Geek of Remodeling" category - for updates as the work progresses.